He said his party came out with a manifesto after consulting various sections of society, such as tribal communities, women and youth, and incorporating their demands. 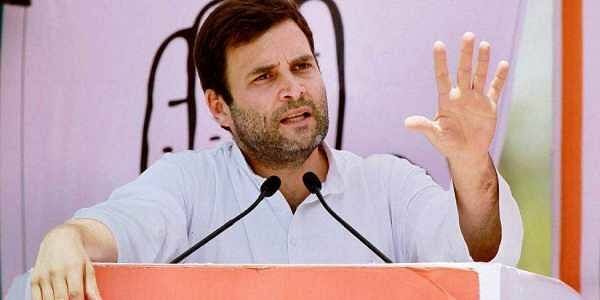 PAVI JETPUR: Alleging that Prime Minister Narendra Modi is silent about the future of Gujarat, Congress vice-president Rahul Gandhi today hit out at the ruling BJP for not publishing its manifesto for the elections yet. At a poll rally at this tribal town in Chhota Udepur district, he said his party came out with a manifesto after consulting various sections of society, such as tribal communities, women and youth, and incorporating their demands. "The campaign in half of Gujarat has already ended. Polling will be held shortly. But the BJP has not announced its manifesto yet. The BJP has not told you what it will do for you in the next five years," Gandhi said. "Modi-ji used to say that the BJP will rule in Gujarat for the next hundred years. But he is not saying a single word about the future of Gujarat at his rallies. "Instead, Modi-ji talks about Afghanistan, Pakistan, China and so many global issues. This election is not about Modi or (Rahul) Gandhi...it's about THE people of Gujarat," he said. "The BJP is ruling here for the last 22 years. Now you have an opportunity to elect a government which would focus on you. People want to know what the BJP or Congress would do for them. While the BJP has not declared its manifesto, we held extensive dialogue with THE people and prepared our manifesto accordingly," he said. All key demands of tribal communities, such as implementation of Panchayats (Extension to Scheduled Areas) Act, filling up vacant posts reserved for STs, scholarships for tribal students and better compensation for land acquisition, have been included in the Congress manifesto, Gandhi said. The BJP government snatched away 6.5 lakh acres of tribal land in Gujarat without giving proper compensation, the Congress leader alleged. Voting for 89 seats of Saurashtra and south Gujarat will be held tomorrow, while that for 93 seats of north and central Gujarat, including Chhota Udepur, wILL he held on December 14. Campaigning for the first phase ended yesterday.